The Network received some sad news from the Virginia Coast Reserve LTER this week. They shared the following remembrance of Bruce Hayden, who passed away on September 10. A memorial service will be arranged later in the year. The family asks any donations in lieu of flowers be contributed to your local volunteer rescue squad or to support research at the Department of Environmental Sciences, UVA. Bruce Hayden passed away September 10, 2018. He was a long-time member of the faculty of the University of Virginia as well as a key contributor to the NSF Long Term Ecological Research (LTER) program and to the initiation of the National Ecological Observatory (NEON). Bruce received a Ph.D. in Biometeorology from the University of Chicago and came to the University of Virginia in 1970 as an Assistant Professor. He was the first State Climatologist for Virginia, a post he held for several years. He rose through the academic ranks and was promoted to full professor in 1985. Bruce was a truly interdisciplinary scientist, and he had a talent for teaching that coupled concepts across boundaries. He developed a variety of courses in this vein such as “Environmental Climatology” for students of environmental science and a “Built Environment” class geared toward students in the Architecture School. He was a remarkable teacher who used the classroom to test new pedagogical approaches, and he received the All-University Teaching Award in 1996-97 in recognition of his dedication to and innovation in instruction. Bruce’s research interests were broad and included coastal geomorphology and ecosystem dynamics, global change and historical climatology, and vegetation controls on climate. He studied storm frequency and impacts on the mid-Atlantic coast, including the Virginia Coast Reserve (VCR), home to an LTER site. Bruce served as a lead PI for the VCR LTER program through the 1990’s. During that time, he helped with a successful effort to fund and build the Anheuser Busch Coastal Research Center on the Eastern Shore of Virginia and he established the intellectual foundation that has influenced the VCR LTER program ever since. Bruce was also known for his work on the distribution of plant communities in relation to atmospheric processes. He developed strong insights into how vegetation, through impacts on water and heat fluxes, influences climate. He was working on a synthesis of these ideas at the time of his death. 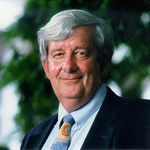 In addition to teaching and research, Bruce served the University of Virginia and the broader scientific communities in a variety of capacities. He was Division Director for Environmental Biology at NSF from 1998-2000 and then went on to develop the general conceptual design of the National Environmental Observatory Network (NEON), serving as founding NEON Co-Director from 2004-2006. Bruce was Chair of Environmental Sciences from 2001-2003. He retired in 2013, continuing as Professor Emeritus. Bruce’s teaching, research and service contributed immeasurably to the success of the Department of Environmental Sciences at the University of Virginia. His work on climate and ecosystems will have a lasting scientific legacy. His good humor and effective leadership will be greatly missed by his many friends and colleagues.